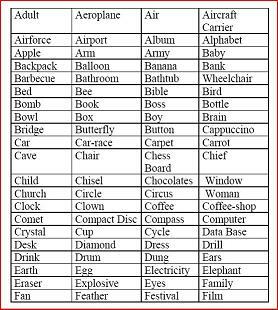 Play these Word Games - Antakshari, Rigmarole, Memory, Dud, Atlas - with kids and have fun with vocabulary and spellings. If you need more information about games other than the ones found on this page please use the Contact Us Page. Word Games 1 : Antakshari. Antakshari is an Indian word which means the last letter. That is what the game is all about. How many players are needed? The more the merrier. If there are eight players or more you can divide the group into two teams for the game. How is it played? The non-team version. 1. Everybody sits in a circle. 2. Pick the denner (the player who will start the game): Recite a rhyme - one word per player. The person at which the rhyme ends will start the game. Possible rhymes: You could choose any of the nursery rhymes that you remember. If not, you can use one of the following. The first one is an Indian rhyme usually used to find the denner. You can use it if you can get your tongue around the words. The second is an English rhyme. Akkad bakkad bambe bo, Assi nabbe poore sau, Sau me laga dhaga, Chor nikalke bhaga. Inky pinky ponky, Daddy had a donkey; Donkey died, Daddy cried, Inky pinky ponky. 4. You can decide to continue the game clockwise or anti-clockwise. 5. The next person in the circle has to say a word which begins with the last letter of the first word. 7. In the team version, the team thinks up the word. If a team is taking time to think up a word, the other team can use a countdown like the one in the game Name, Place, Animal, Thing. 8. This game can also be used with songs (my children prefer to use peppy songs and have rip-roaring fun with the game). The players should think up songs which begin with the last letter of the previous song. The student will choose one such code or make up something entirely their own. Then in turns, each will present their code to the class. The class has to guess the word and then define the concept. A student can choose any of the concepts that are being practiced in the class. Word Games 3: Rigmarole: This is another example for 'word games' which is played in group setting. In this game the group spins a story. The more ludicrous the story more the fun. 2. The denner begins to spin the story. The rule is everybody says a couple of sentences at a time and should end their spin with a conjunction. 3. The next person picks up the story and adds her spin. Again the norm is a couple of sentences ending with a conjunction. 4. The aim of the game is to make the story as ludicrous as possible and have fun while spinning the story. Word Games 4: DUD: Here is another great word game for kids, which you can use to enable them to learn spellings in a fun way. You'll need a group of four to five people to play this. The game is called 'DUD'. Remember this is a word game and the aim of the game is to escape completing a word and becoming a 'DUD'. If you complete the word three times in a row you are a 'dud'. The first time you complete a word you become a 'd'. The second time you complete a word you become a 'u'. The third time you complete a word, you become a 'd' and so as a 'dud' you are out of the game. How is this word game played? Let's imagine that a group of five is playing this word game. A player begins with a letter (any letter) say 'A'. The next person can add another letter to this say 'l'. The third person starts to guess the number of words that could begin with 'Al', so she might add 't' as her bit. Suppose the fourth person says 'a', the fifth person has no option but to say 'r' and complete the word 'altar'. As she has completed the word she is penalised by being assigned first 'D' of 'DUD'. As she completes the word 'altar' she also calls out 'D'. A twist in the game: Suppose the fifth person says 'i' instead of 'r'. The next person in the group might get suspicious that she is trying to bluff her way out of completing the word. So the first person (remember we are using a group of five people and the person next to the fifth person is the first one) calls out 'challenge' to the fifth person. Now the fifth person is obliged to complete the word or accept the first 'D' of the 'Dud'. So if she knows that there is such a word as 'altaic' she can say it and escape being a 'dud', or if she was bluffing then she has to call out 'D'. After one word is complete the game starts again with another random letter. Whoever gets 'd', 'u' and 'd' first becomes the 'dud' and is out of the game. This way the game goes on and whoever remains finally is the winner. 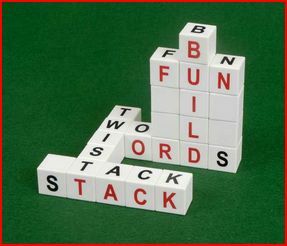 Generally children have fun by bluffing their way through the game and avoiding the completion of a word. There is a lot of laughter when somebody's bluff is called and she is challenged. For younger children, have wordcharts displayed in the room, so that they will be encouraged to play. A sample word chart is shown above. Here's another simple and great word game that you can use in Geography. It's a great word game to enable children to learn and remember the names of places. You can use it with any class of facts. You can use it for places, rivers, concepts etc. A group of 8-10 kids is an ideal number to play this word game. If you have many more kids in your class you can make two to three teams. The game begins by the group of kids spelling out the word 'ATLAS', one letter per kid. Whoever gets to say 's' of Atlas begins the game. The beginner picks a letter of the Alphabet say 'A' and names a place that begins with 'A'. The next person also names another place beginning with 'A'. Like this the rest of the group does the same, until the group feels it has exhausted all the places beginning with 'A'. Then the group starts the next round with another letter say 'D'. In this manner the game goes on with the other letters of the Alphabet. Of course, if there are two or three teams, the teacher or the adult decides the letters of the Alphabet that the teams will play with. The teacher or the adult keeps track of the number of places that each group has been able to recall from each alphabet. The group which is able to recall the most number of places is the winner. This game also doubles as a way to practice the use of the dictionary. The participants are divided into groups of 6 people. Each group is given a dictionary. 1. The sequence in which the game will be played is decided in advance, i.e., group 2 follows group 1, which is followed by group 3 and then group 4, until all the groups have taken turns. 2. Each group gets only 30 seconds to answer. The group that does not answer does not get a mark/score. The next group gets the score, if they get the answer. 4. The first group in the sequence has to look in the dictionary for the next word, but which begins with 'dj'. Suppose the word is 'djellaba'. 6. The third group looks up a word that is in dictionary sequence upto the 4th letter. The 5th letter is the last in that sequence of dictionary word list. If after the 5th letter there are still groups left, they should start with the next word. 7. The game continues until all the groups in the sequence complete 1 round. Scores are taken stock of at the end of the round. Two to three rounds are played in this manner. The winning group gets an applause. I played this game for the first time in an English Language Teaching training in Nasik last week. The teachers went overboard over it. I hope you have fun. Another kind of word game is to use 'cross and dots' grid. Here's a video of this kind of game. Go to the following link on Youtube. For information on more word games please go to the Contact Us Page. Also get a monthly e-zine 'Stories for EL' free for stories that you can use to emphasise experiential learning. Stories and their lessons are easily remembered. They can also be used to communicate a concept effectively. They add the 'aha' or 'Eureka' or 'got it' factor to presentations and lectures. They are great tools to use in debriefs of games, to drive home a crucial point.